Unique, one-of-a-kind, best-of-breed…blah, blah, blah. We see this type of marketing speak over and over in press releases and promotional materials. And let’s be honest, we’ve all used it at one time or another — shame on us. But which buzzwords are the most overused? I saw an item in PR Daily recently using the MoMA press release archive to demonstrate how press releases were much better years ago. That got me curious about which terms are currently being most abused. I hadn’t come across any anti-buzzword content lately so I thought I’d do my own research. 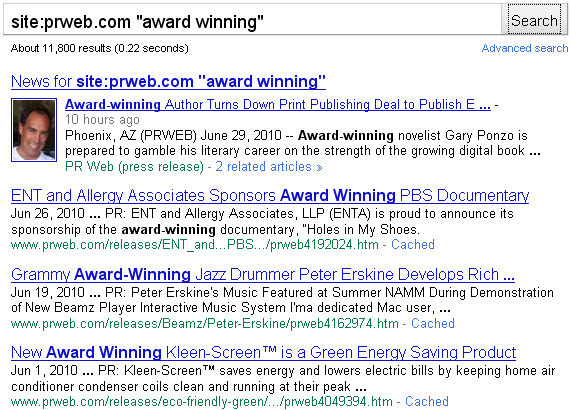 I opted for Google over PRWeb’s internal search because internal search results are not typically very good. I chose PRWeb over PR Newswire, Business Wire, etc. because it was among the first search-friendly services so I figure its content is fairly well indexed. And from what I can tell the PRWeb archive dates from 2006 so that is a good way to check press releases from just the last four years. To come up with the list of buzzwords I started with the usual suspects then got some more ideas from Wikipedia and TechCrunch. This led me to David Meerman Scott, who I realized did something similar back in 2007 and then again in 2009 using a different set of terms and a larger range of press release services. My list of terms could have gone on endlessly but I decided to cap it at 75 100 (the list is growing based on suggestions in the comments). A lot of what I have included is more marketing speak than technology or industry buzzwords since I wanted to look at overused words across all industries. If there are any glaring omissions please let me know and I’ll add them in. “Leader” was the most used term by far — funny how many companies, products and services anoint themselves as “the leader” or “a leader.” And it is not surprising to see “unique” in the top five since we all think we’re special, now don’t we. I was glad to see “revolutionary” with less than 5,000 mentions. That one was overused like crazy in the 1990’s. Which terms do you think are the biggest offenders? What would you love to see stricken from marketing speak forever? What a cutting-edge, mission-critical blog post. Thanks for the mention and for adding to the research in this important subject. Thanks David, I did my best to make it best-of-breed. Your Gobbledygook Manifesto is a great resource. How about this: “As a leader that’s leading the best of what’s unique to the largest and most innovative innovators, is our award winning solution.” Huh? This post should be printed on the wall of anyone that writes technology press releases. It’s certainly going on mine. Great post Adam. Some classics in there. You should issue a challenge to write a media release with all words/phrases included. See if you can get that into your next meeting. Millennials through boomers keep using “great” and “amazing.” Drives me nuts. Bookmarking this list Adam, just to check myself. Other buzz, hype words I see that may be overused are “top” “premiere” and “savvy.” Thanks for sharing this. What a great list. I’m surprised ‘leverage’ isn’t higher. Tom – good idea on wall posting; we all fall victim to using some of these terms from time to time. Carly and Paul – that’s great material for a whole other post on “meeting speak.” And Carly, I thought “leverage” would have been higher too. Rachel and Davina – thanks for the suggestions, I added those terms to the list: “top” 32,500, “great” 26,800, “premier” 10,700, “amazing” 5,320 and “savvy” 2,800. “Top” and “great” took spots in the top 10. Adam, if you were inclined to take Shane up on his suggestion, I’d be happy to offer a free distro. We could make it an educational piece, add some video, link to your blog and make some suggestions for improvement. Feel free to hit me up offline if you are interested — fstrong-at-vocus-dot-com. How about a contest for a release that doesn’t use any of the top 20? Very intriguing post – i like it. I am gulity a charged for over using number 49 – Strategic Partnership!!! Look forward to the one on meeting speak! How about a contest for a release that uses all of them? So happy to see the worthless “solution” high on this list, which did not appear among the top offenders in the Gobbledygook Manifesto. Amazingly, we in the tech PR business have been fighting to keep this c**p out of press releases for years, and still have to fight to keep it out every single day. These terms must be included in a vocabulary course that is mandatory in every engineering school in the country. Frank- sounds like a great idea, if I can pull off writing the release that is! I’ll email you. Skip – thanks for the link, that site still holds up well. Sajaad – I bet we’ve all used “strategic partnership” one time too many. And I use “leverage” too much; it’s probably time to give that a rest. Pamela and Kaliced – both contest ideas sound good. Great post Adam. Thanks for referencing mutual friend David Meerman Scott’s Gobbledygook Manifesto: http://www.webinknow.com/2006/10/the_gobbledygoo.html. Synergy is the one I hate most! Especially from sales guys doing presentations. Now…if we could only get our clients to stop putting these words back into our edited releases. Particularly the word “innovative”. ! Debbie – thanks for the suggestions, I’ll look at those if I do another update to the list. Bill – well said. Present the facts and let the reader decide. I wonder if now that many press releases are seen directly by the public (skipping the media as the middle man) there is a tendency to use more marketing speak as a way to try to influence perceptions. But I’d think the general public would greet that type of language with similar disdain. David – thanks. There’s also a link to David Meerman Scott’s 2009 update above. Patrick – I agree, “synergy” is ready for retirement. The numbers are a little skewed on that one because there were releases from companies with “Synergy” in their name. Colson – having marketing speak added back in is the worst! Gloria – glad you found it useful. “Feature rich” is probably my favorite, especially when used in a sentence along with “robust” (which did make the list). FWIW, folks in university PR are doing everything they can to get “world-class” and “state-of-the-art” into the Top 10. My theory is that our ranks include a lot of former journalists who wouldn’t be caught dead using a word that’s clearly opinion, such as “best,” but they’re willing to let these two adjectival phrases and a host of others that are more vague in terms of their promotional impact. The advice I always offer in this area is “show, don’t tell.” Show me why something is the best in describing its qualities and I’ll make my own, more credible conclusion that it’s superior. That said, I’d be lying if I said I hadn’t used “state-of-the-art” — but only when that’s truly the case. can’t believe “thrilled” didn’t make the top 80!! Perfect storm. Partner. Transform. Re-purpose. Bill has nailed the dynamic in higher education. My peeve is “cutting-edge” in the medical context. How could I forget “cutting-edge?” Good point. And while we’re at it, let’s ban quotations in any news release. First of all, most are made up by the public relations person (guilty) and not by the actual person quoted. Secondly, most quotations are hyperbole and add nothing substantial to the the news release. Thirdly, most decent publications would never use manufactured quotations, so they are a waste of everyone’s time. Debbie, Carol, Dan and Moe – I added six more terms based on your suggestions: “thrilled” 4,530, “transform” 2,700, “iconic” 1,200, “re-purpose” 1,050, “feature-rich” 757 and “perfect storm” 162. Bill Sutley – thanks for your thoughts on university PR, sounds like that applies to a lot of sectors. I agree, “show, don’t tell” continues to be solid advice in writing. And thanks for sharing the video! You’re right – it’s not just PR professionals falling back on these over-used words, it is journalists too. Driving continuous improvement, driving discoverability, driving anything that’s not a car or truck. And how about “aligning our business goals with a more intuitive customer experience”!? Great list, thanks for the work. Great list to have as a resource to keep us in check. Now here’s the real question: is it the PR practitioner’s duty to NEVER use these words, because just because they are OVER used doesn’t mean they aren’t the most appropriate word in certain situations. If we discard trend worlds like a pair of of shoes everyone seems to be buying, and we are constantly thinking up new ways to say things… new catch phrases that will just wind up on this list five years from now… what is ultimate the solution to our speak? We can word and phrase bash all day, but how do we achieve the best release? Given this definition, “leader” and “best” are not buzzwords. They are just part of our lexicon. Two buzzwords making the rounds in colleges and universities are silos and dashboards. Elizabeth – that’s a great point. Especially as the list has evolved to include more overused words than actual buzzwords (see my comment to Edward below), there are absolutely times that it makes perfect sense to use some of these words. But I think we’re all guilty of falling back on them a little too often, which ultimately dilutes their meaning and in extreme cases makes them cliche. Edward – I absolutely agree. While I started out looking at buzzwords, in reality most of what ended up making the list was more “marketing speak” than buzzwords. And as the list continued to evolve a lot of the terms added would be best defined as overused words. But I decided to stick with my original title, figuring “The Most Overused Buzzwords and Marketing Speak” covered all of the above. In the table I just changed the first column to “Buzzword / Marketing Speak / Overused Term.” Maybe I’ll change the title to “The Most Overused Terms, Buzzwords and Marketing Speak” too. This list is an eye-opener and for editors who get our releases, a mouth-opener as in ‘yawn.’ Imagine what it’s like to read release after release filled with the same words? It’s tough because part of our company name is ‘Innovative.’ As a healthcare provider, almost every release we send out has the word ‘compassionate’…quality is another one. I agreee with Elizabeth…what do we do? Editors don’t have time to read much before they like it or toss it. You can call some of these “marketing buzzwords” – which will give them negative connotations to all the old English Majors like myself – but a few of them are now quite practical descriptions of technology or the work we do. For instance, “real-time” or someone mentioned “dashboards” in the comments. I have no problem with that if used correctly. Cliches, however, must be eliminated. “Out of the box” is the worst of these. What I most hate to see, in press releases or other business communication, is the overuse of acronyms. Many are used so often the users can’t define the actual meaning. I am very impressed with this article. Thank you for the information. One of the fearless *leaders* in my PR career (who is a former journalist) told me to never, ever, never use the word ‘unique’ unless the product, idea, concept, etc., fit the description of unique (i.e., never been used, done, applied before this day). I’ve never used the term, because it should be special and reserved for something that is, well, unique. Have to admit, I’ve used other terms, such as leader (shame on me). I think we sometimes get lazy about our writing. Not good. Jill – that’s a good point, I would not want to have to read through release after release with the same old stuff over and over. That’s one thing I like about social media releases; the format helps to keeps things short and simple, though even brief summaries and bullet points fall victim to marketing speak. But I bet you get a pass on having “innovative” in your company name; there’s not much you can do about that. Glenn – I agree about “real-time.” I hesitated on that one because it does have legitimate meaning and usage in certain contexts. But I decided to include it because I think it is a good example of a legitimate term that starts to get co-opted by marketers to associate their products/services with a particular trend, even if what they are offering is not truly “real-time.” I wouldn’t be surprised if that does become an overused buzzword within 2-3 years. Good point on acronyms too. Brittany – thanks, glad you found it useful. Marilyn – I agree that “unique” is one of the worst offenders and it really has lost all meaning within marketing copy. We do tend to fall back on certain terms, maybe more out of habit than anything. Your list is tech industry focused. Coming at this problem as someone who works in the nonprofit and health care sectors, let me add “community wellness” to the list. I also learned years ago in journalism class not to use the word unique. And am surprised every time I see it. Gina – yes, I can imagine you’d see a lot of “community wellness” in non-profit and healthcare. Jill Beach commented earlier that she sees a lot of “compassionate” in healthcare too. Keep it up and we may end up with no words left for news releases! What would we writers do then to make a living? It’s an interesting dilemma. If we pen the over-used lingo, we risk sounding so ‘been there-done that’. However, with the prolific use of the Internet to mine information, if we don’t use ‘award-winning’, for example, do we risk not showing up in someone’s Google search?! Let’s create a future list of over-used buzzwords! I swear, if I ever again hear anybody (other than McDonald’s) use the term Secret Sauce, I will mix up a batch of my own, laced with cyanide, and shove it down the offender’s throat. I just help these words (the neologisms, the downright non-words I won’t accept as worthy neologisms, the pleonasms, etc.) along in their … self-realization (in the Nietzschean sense) of sorts. Since Cloud Computing is all the rage, I tried your search on the word cloud. 3,860 results. Ecosystem 1200 results!! I cringe every time I see that word used in an IT context. I’ve always been a fan of “space-age”. The “space-age” began over half a century ago. How revolutionary is a product if you were to say “made with over half-a-century old technology”? I don’t think it’s a fault of marketing or even PR, but lazy or cowardly executives afraid to stand out. Too innovative a marketing message and they run for the nearest boilerplate from their favorite competitor. But then, we can’t all be special, can we? I worked on a project a few years ago where the phrase, “low hanging fruit” had to be the most over-used, totally worthless thought ever to come to mind. I still cringe at the sound of it. Thanks for the overused words. Next, we need to catalog pr and marketspeak uneccesary jargon, such as using “team” as a verb (We are teeming. ), glean, magnify, talk offline, leverage, deliverables, sticky, rich, and all the other awful jargon that marketers and public relations people use to show everyone how much they know. They really only know how to use language stupildy. Thanks for this list. Now I know what to avoid when I write but moreover, I know what to avoid when I speak. This is also a good (party) game to play to see who can “avoid” using these words until they go home. Jim – “Cloud computing” is another good example of terms like “real-time” that do have legitimate uses but often get co-opted by marketers to tie a product/service to a hot trend. As a result it’s probably already on its way to overuse, as you pointed out. Justsomeguy – “ecosystem” is another good one, thanks. Nic – good point on “space-age” – that’s funny actually. Derek – you’re right, sometimes the decision to use marketing speak comes from above and the PR department has their hands tied. William – that first sentence of that iPad description is great, you get both “magical” and “revolutionary.” 🙂 I guess since it’s a product description rather than a press release they get a little more leeway, but that’s still quite a twosome. Because the full description was a bit long for a comment I edited that out but left the link for those who’d like to view it. Tim – “low hanging fruit” is a great example of overused meeting speak, thanks. Marc – thanks for the additional suggestions, you’ve got some good ones in there. Great list and fantastic work but have two comments. Most of these words are common language designed to provide some differentiation between available choices (ie the base definition of marketing) – it’s a tough one I know but it would be a very strange PR release that used the antonyms of these words. Your opening comments on how much better PR releases were in the past – it would be interesting to see a similar list of their over-used terms for comparison. p.s. Why do I keep seeing this image in my mind of a four-color flag? Sebastian – the Wordle looks great! Thanks for doing that. Andrew – thanks, and you’re right, as the list evolved many of the terms now fall more into the category of overused common language. In terms of providing differentiation there must be a point when a term has been overused to such a degree that it loses its ability to differentiate, as the reader just glosses over it. Regarding the assertion in PR Daily that press releases were better in the past, unfortunately the MoMA press release archive they linked to (which dates back to 1929) isn’t searchable by keyword or I’d test out some of these terms. I’d guess that every decade or so has it’s own set overused terms that lean more towards buzzwords and jargon, but there must also be some more common overused terms that have stood the test of time. Also, I’ve added another group of terms to the list based on suggestions from Alison, Gabriela, Markham, Jill, Gina, Mel, Jim, justsomeguy, Nic, William, Tim, Marc and and Frank – thank you. “Smart” 6020, “sustainable” 4,720, “cloud” 3,260, “dashboard” 1,310, “ecosystem” 1,020, “magical” 853, “stack” 673, “value proposition” 519, “mindshare” 415, “space-age” 386, “sticky” 326, “silo” 272. I wasn’t sure about some of them because they do have legitimate use in certain contexts (e.g. sustainable, ecosystem, cloud). But then in looking at what’s already in the table there are plenty of terms that do have legitimate use but tend to be (or are starting to be) overused and/or co-opted by marketers. So I figured the ones I was unsure about also fell within those parameters. And since the list has been evolving more towards overused words I thought it would be good to get some more buzzword-type terms added. Gina – since it is healthcare oriented I didn’t add “community wellness” but for your reference there were 89 mentions. Alison – you’ll be glad to know that “aligning business goals” had only 1 mention and “driving continuous improvement” and “driving discoverability” didn’t have any. My agent sent me your list to motivate me as I complete BETTER THAN GREAT, a book offering some 6,000 alternatives to our most shopworn superlatives, including great, amazing, awesome, and unbelievable. As if I needed motivation! In previous books for writers I’ve railed against stale modifiers, and lately the endlessly brayed word “AMAAAYZING” has put me on the warpath. I don’t mean to promote a product here—just say thanks for underscoring the need for some fresh vocabulary of praise and acclaim. I guess I’ve got to re-write our website and it looks as though there can be no more press releases or corporate descriptive writing, because I fear that few people have a vocabulary beyond those 100 words! I know that htis leader is a unique strategic thinker that will drive results to make you all crazy! Of course, now i can’ wait to see Arthur Plotnik’s book. Arthur – sounds like a great book! (pun intended) 🙂 Best of luck with it. A friend of mine was compiling a similar list of phrases journalists use in stories and it’s always a bit startling when you see this type of thing out there and realise how lazy many of us have become. I’ve resisted posting additional comments, not wanting to hijack the discussion or contribute frivolously to something already so well developed, but I had checked the notify-me box tracking comments that followed my July 3 posting, and wanted to draw a distinction between common gratuitous superlatives and what I think of as buzzwords: Terms usurped from other fields and usage warped to a new purpose that suddenly rise in popularity following some influential initial occurrence. Usually, there are well-established words already in place that are displaced by this new shiny. Among my examples were ecosystem, a term that had always been used in reference to organisms, not software (! ), stack, a term used in reference to a vertical physical arrangement of objects, not software (! ), and space, a term used in reference to a tangible area and volume, not a niche in a software market (!). When Microsoft, for example – and that was my allusion to a four-colored flag – says that their products are, “designed to function as a stack in the ecosystem of the computer server space,” those are all perfectly pure buzzwords. What they meant, and what would have appeared in advertising copy before buzzwords became de rigueur is the claim that their software products work together providing a range of functionality in the server market. I find buzzwords cringeworthy, and strongly favor the latter. Again, drawing a distinction between this, what I would define as pure buzzwords, and empty superlatives – and that is not to say that buzzwords and superlatives cannot be apt and accurate, they can and often are – you would be able to divide this list neatly into two camps. I don’t know if that suggests that anyone pursuing this further, such as the author of this blog post or that author who is writing a book on shopworn superlatives should consider this distinction, whether they agree or not. gingergirl14 – “stakeholders” is a good one, thanks. Frank – I agree, buzzwords are indeed a separate entity from marketing speak and overused/shopworn terms. While I originally intended to focus solely on buzzwords, as the list evolved over time it grew to include all of the above so I decided to expand the parameters of what I was looking at. Edward Bury had also commented on the buzzword distinction, which led me to expand the column heading in the table to reference all three. Thanks for taking the time to pull out the pure buzzwords and do the word association, it’s much appreciated. And your Microsoft example is a great illustration of how various terms can get turned into buzzwords. This is really interesting, thanks for taking the time to make this list! Thanks for the list. I’ll have second thoughts the next time I use any of these words. We all try to stay fresh. Ha. You might enjoy the website http://fightthebull.com. It has an app you can download that tells you how much BS is in your writing. Definitely worthwhile. Kelly – Thanks for the suggestion, I’ll check that out. Thanks for sharing Douglas. Interestingly some of the terms that have the greatest impact in blog post titles are exactly the kinds that need to be avoided in press releases. Now that we’ve all agreed what *not* to do, can we play along with Frank’s idea and come up with shining examples of more creative language? Perhaps we could hold a contest for real innovative press release writing, or highlight a case of a well-written release that omits all these words? The Bad Pitch Blog has done a great job of highlighting positive examples recently, and I’ve found it a valuable resource. Good ideas Maura; sometimes it’s a lot easier to point out the bad then come up with the good. 🙂 With press releases, I’m in favor of a simple “tell it like it is” approach with as little hyperbole as possible. I think this also works well in the age of press release optimization, since people are less likely to include over the top terms in their search queries. I also think that social media releases help to reduce the use of marketing speak. Since they tend to be shorter in nature it and utilize more bullet points, etc it forces the writer to get to point without much fluff. Thanks so much for these lists–they’re as refreshing as a good visit with Strunk & White. While we’re at it, can we ban “brand”? I know it doesn’t appear in press releases but it’s mentioned in every single meeting that leads to a press release: “How do we brand ourselves? What’s our brand? Are we branding this correctly? How will we manage a brand extension?” And I have yet to encounter anyone who knows what it means. While I found this to be a unique and groundbreaking listing, one has to question the ROI that can be achieved by empowering marketers to leverage language differently and adopt best practices that move away from descriptive hype, which many view as their secret sauce. Thoughts? Thanks for the list…truly world class! I reluctantly agree, Leslie. Marketers are unlikely to accept the benefit of dropping what they see as clever phrases and speaking plainly. Hey, wait…I can read this stuff! I believe we have our Rosetta Stone in Adam’s excellent list. My least favorite phrase is more buzzword than marketing speak, but it’s a rare meeting that I do not hear about an effort to “reach out to…” one person or another. When did “call” or “contact” lose the battle to “reach out to”? “Passion” and “heads up” drive me up the wall, written or spoken. How about the ever-intriguing phrase ‘breaking news’ ? Clement and Peter – those are good ones too, thanks. I should do a separate post just on “meeting speak.” There have been lots of good suggestions here over the past month. Elena – Good points. Rather than using more ordinary or even unflattering adjectives, I think what the media and the public at large (who encounter press releases on websites and search engines) would most like to see is companies providing the information in a straightforward manner without all the hyperbole. Too often over-hyped releases end up costing a company the attention it seeks because they end up disregarded. Yoav – I actually did a post last year on that: Do People Search for “Breaking News”? But is it a question of hyperbole vs. straightforward, or fresh vs. stale— fresh vs. flat or cliche? As an editor and target of pitches and press releases, I expected hyperbole and paid attention to it if it was novel, inventive, delight-giving. As you all know, language sends a message beyond the literal; in this case, that someone has fresh ideas, fresh approaches, risk-taking initiative. As for staightforward search terms, one can always plant these, too. But enough from me in this coruscating discussion. My pet peeve is on your list: “iconic.” The worst! This discussion hinges on the presumption that press releases have significance to anyone other than the people who write them and the “journalists” who cut and paste them in their news sites. I stopped reading press releases a long time ago. They are irrelevant beyond serving as a notice that a new version of the product was release, prompting me to look at the release notes to see what was in fact released. Most press releases make me gag, they are so full of meaningless marketing hype. They turn me off on the company that publishes them more than anything else. You can rewrite them all you like, they are irrelevant. I’ll read a blog by someone with so valid commentary and check the product data sheet if I want to know something about the product. It’s all so Republican sound-byte! What’s the point of all this? Who the hell believes all the deluge of verbage that spills out into our inboxes every day anyway? What makes this a great survey? Like press releases this post is all about self gratification and ego. We publish press releases to serve as a historical marker for all to measure our achievements. The continually growing divide between North America and the rest of the world is epitomized by wasting effort and time creating new superlatives and surveying them like this but not really telling us what is actually being sold. Death to the Republican sound-byte. Arthur – excellent point; you can be straightforward but still interesting and engaging. Therese – I agree, “iconic” is definitely thrown around too much. Michael – Hard to argue with any of that. A large percentage of the press releases out there probably never needed to exist in the first place. Richard – I really did just think it would be interesting to see what terms are most overused in press releases these days. But I do agree with your point that the best approach is for companies to just provide straightforward information and leave the rest behind. Thomas – “dimension” is an interesting possibility, thanks. As of today it comes up 932 times. To my surprise (and relief), I can’t believe ‘legendary’ is not on this list. That is one that always gets me. Mark – “legendary” is a good one; I just checked and there are 2,780 mentions, placing it at #42 on the list. I just added it along with an earlier suggested “stakeholder(s)” (with 1,200 mentions) to bring the table to an even 100. John – I wonder if using “absolutely” by itself started out as “I absolutely agree.” As for the use of “absolutely” in press releases, there are 2,780 instances of it, so that is candidate too. But since your point is more about its incorrect usage as a single term, and as adverb it is not necessarily overused in releases, I opted not to add it at this point. Thanks Adam – my personal bugbear is ‘delighted’ used in quotes. I have visions of CEOs with permanent grins on their faces. Though I’m sure we could survive seeing ‘secret sauce’ used more. Love this list. I now want to see the words most used by journalists in publications. Chris – “delighted” is another good example, and thanks for sharing your post. Thanks for NOT including “game changer” in your list. I keep worrying that I’m going to snap the next time I read it. Uggh. How could you miss ‘one-stop-shop’ and ‘solution provider’ (though I see you have solution driven)? Otherwise a world-class list, best of breed even, possibly mission critical to some end-users and evidently very scalable! Awesome job! Wait a minute. Is “awesome” on the list? Lance, Huw and Dennis – those are all worthy suggestions, thank you. Just for curiosity I ran a quick check: “one-stop shop” 1,260, “solution provider” 894, “awesome” 791 and “game changer” 148. Great piece of research. Inspired us to do an analysis of our press release wire in the UK, albeit with a slightly different approach. We just looked at word frequency, not just buzz-words but all words. I was actually suprised that the buzz-words didn’t appear higher up in our results. I guess we just found the loyal gathering of supercilious sycophants. So you don’t think there are lots of companies out there, who have products which include a dashboard. A widely understood word describing the feature. Are those companies not allowed to include that feature reference in their press releases? What if they have more than one product? What if they update that product? Shall we limit their use of the word to just the first press release of the year. What a ridiculously out-of-context notion. Daryl – Great follow-up post, thanks for sharing. It’s good to see that not too many buzzwords made the overall top list. I’d imagine that’s the case with releases on PRWeb too, but I don’t have the ability to check that. Julian – it’s a good point, but I don’t think that anyone is saying that none of these words ever have legitimate use and to be clear that is not the message I’m trying to convey. “Dashboard” was added after a suggestion in the comments; there is some discussion about it and other terms like “real-time” above that you may have missed. I definitely agree that both have legitimate uses so their inclusion is borderline. But I decided to add them as examples of legitimate terms that start to get co-opted by marketers to associate their products/services with a particular trend or terminology, even when that’s not really the case. So those are terms with the potential to be abused or overused – sort of buzzwords in the making. the worst offender this week was the common wealth games was like watching paint dry seen more life in a glass of alka Seltzer, with the exeption of the India womens relay team. controversial games dogged by contoversey so annoying..
Let’s not forget “at the end of the day” as a conclusion-signaling device. I hear that phrase one more time, I’m going to puncture someone’s eyeball. In speech “actual” and “actually” probably outnumber all the others combined. I’d be interested in a similar table for speakers, but it would be difficult to assemble. R.
I was shocked not to see “value added” in the list, but I suppose that phrase is so 10 years ago. One construction that currently drives me bonkers is much more often spoken than written … namely, the tendency of tech speakers to begin answers with “So.” It appears to be the verbal equivalent of “As it turns out” or “Long story short” – but the fact that it PRECEDES everything else in the ensuing sentence is rather awkward to my ear. Must be a California thing. It’s very surfer dude-ish. “So” replaces “Yes,” “No” and even “Maybe” yet buys the speaker plenty of time to concoct a reply. In fact, I’d go so far as to claim today’s computer nerds wield “So” in the same manner that Bill Gates’ generation used “As it turns out” or “I don’t know how technical you are, but…” as a way of omitting the frightfully minute details which tend to scare away lay audiences. Drew and Reginald – “at the end of the day” is a great example of meeting speak and I agree on the overuse of “actually.” I’d like to do a separate post on the spoken word offenders some time. Thanks for this fun post! May I suggest: thought leader and thought leadership!!! Also, the word “premium” usually is a clear indication that you will pay more now for added features than any future benefits to you are worth. I admit, I’ve used most of these except for maybe synergistic even though I love the meaning of that word. Though, I’m happy to say, I’ve never used the term out-of-the-box. I’m also getting really tired of thought leader. The idea of someone leading my thoughts makes me nervous. Thanks Katherine! And I agree, “thought leader’ is a good one. Tracy – I think we’ve all used a healthy portion of these at one time or another. And to be fair, in certain contexts some of them have legitimate uses. But many certainly do get overused. I hate to break it to you, but there’s a new overused phrase coming round the bend and you’re using it. That word is “engaging”. A couple of years ago, you very rarely heard it but now you hear it all the time. Keep your ears open over the next couple of weeks. You’ll be astounded. I wonder who’s circulating the secret memo about engaging. You’re right James, various uses of “engagement” have certainly become very popular in recent years especially as relates to social media. Personally I find that one descriptive and useful but it’s certainly well on its way to being an overused term. These are great, some of them made me laugh. I actually did not recognize some of them, until I really thought about it. I was also reading through some of the posts, and “Absolutely” and “Absolute” are so over-used when I am working. Also nothing is more fustrating than hearing the same word used twice. Or seen. And what’s worse is when you catch yourself saying it!! Spoken (and most likely written) ad nauseum – “in terms of” So sick of it! The one that creases me up time and again is a use of “solutions” in the IT industry, where more and more communications is being done via the Internet, using the ubiquitous Internet Protocol (IP). Well when styling everything as “solutions” was new & becoming all the rage, I worked in a department for a while that was known (officially) as. ‘IP Solutions’. Though I still work for that same department it’s name has changed many times to keep up with the fashions, and my colleagues still fail to see the funny side. Now we’re just called UC IT IS Platforms. Teresa – glad you liked them, and I agree that “absolutely” gets overused too. Joseph – “solutions” definitely gets used much too often; I wasn’t surprised to see that one make the top 10. Three of the worst recent offenders. I challenge anyone to go through ten minutes of cable news without hearing those first two multiple times. I really can’t stand ‘new generation’ – when does one generation start and another finish FGS!? In just about every sphere I can think of things evolve and later falter or fade, not suddenly start and stop. Well researched and an Incredible Post. Marketers should be careful using these keywords. What should we use then, specially for startup marketing? Anyone can chart out overuse verses still getting attention? We had a student from Prague. While staying with us she was absolutely dumbfounded by the use of the word “up” in our language. Reflect for a moment on what she was trying to say. She asked me how many meanings this word has. I am not sure why ROI (Return on Investment) has been categorized as a buzzword. I remember this from college back in the 70s…and it was old then. Why would it be still termed a buzzword? Is it because marketing people have seized upon it’s “spin-worthiness”…? I thought buzzwords were limited to what was currently buzzing and not old buzzes. Sorry for being a latecomer to this discussion. I came here to find “stakeholder” which I find to be the most inane of the latest. I heard it during a PTA meeting recently and I almost fainted at the pretentiousness of the speaker. I am so sick of hearing the word “options” in advertising!!!! Is there any other way to say, “Please let me know……..”? My friend and I once played management-speak bingo during a meeting (and were caught). Top phrase was ‘ballpark figure’, although ‘get into bed with’ made us gag as that’s the last thing we intended doing with the speaker. They’ve got the lion’s share of the market there but we need something that’s cross-platform and feature-rich with a strong value proposition. Let’s be disruptive, invite in a sea change and grow this business from the bottom up with a dash of our creative secret sauce. I haven’t jumped in here in a while so just wanted to say thanks for the additional comments and suggestions. It’s fun to see that this thread still gets activity more than two years after I published this post. It certainly struck a chord! Synergy, Anytime someone uses this word, I immediately tune out, it is my B.S. indicator. Adam have you seen this nifty little tool that weeds the buzzwords out of content? http://www.pressat.co.uk/buzzwords/ pretty good. Thanks Justine, I’m glad you liked it! Amy – “synergy” does indeed get overused. It came in at #69 in this press release survey but I bet it’s higher on the list of meeting speak. Mark – thanks, I’ll check that out. I see I’m a little late to the party, came across your this article by doing a search for “is it ok to use the word users in a press release”. How’s that for search engine karma? Regarding the word “users” I think it’s fine, my boss can’t stand the word! See, you didn’t even notice it right? Thanks Adam, keep up the good work. Glad I came across your site. Jim R, I would be careful about including curse words in a draft release and then deleting them before sending around for approvals, let alone to the news media. You never know when your trigger finger will hit Send earlier than you should. Regardless, I think some crude expressions might be worthwhile, especially if your target is an edgy publication or blog. Good point Bill. I really don’t do it that often. It is fun to make up headlines that say what you really would like to. 🙂 Fortunately my editor is not that uptight, he would laugh off. I do agree about your comments on quotes. Thank you Adam. I wholeheartedly endorse this leading, award-winning author and his ability to deliver revolutionary prose with a premium feel. The words flow luxuriously from his expert hand like gourmet coffee, making him the most innovative leader in the industry. While not floating effortlessly through his silky, ground-breaking, best-of-breed coverage; allow yourself to be immersed in the unique, industry-leading, enterprise-class, feature-rich, paradigm-shifting, magical, synergistic, next-generation, cloud-ready search tool. When it absolutely has to be mission-critical, make it Adam. I’m late to this party at this point but the most over used word or expression in advertising these days seems to be “Let’s.” Let’s do this. Let’s get it done. Let’s….